In baking dish, mix rice, sausage, raisins, tomatoes, broth and turmeric. 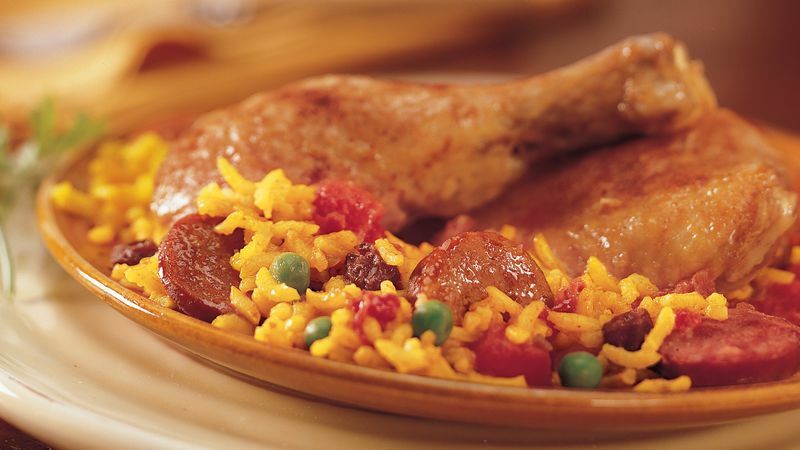 Arrange chicken legs and thighs on top; press into rice mixture. Sprinkle chicken with seasoned salt and paprika. Cover with foil; bake 30 minutes. Uncover; bake about 30 minutes longer or until liquid is absorbed and juice of chicken is clear when thickest part is cut to bone (180°F). Stir in peas. Bake uncovered 5 minutes. This festive Spanish dish is a meal in itself. Complete the menu with crusty French bread and, for dessert, lemon sorbet.